Rest assured your school is in good hands, call us for your free inspection at (718) 565 5332 or book online. There are several types of health care facilities including hospitals, long- term care facilities (which include nursing homes), emergency medical care centers and physical mental rehabilitation facilities. These facilities can be any size, from just a few beds to more than a thousand. Each will have similar problems. Pests such as cockroaches, ants and rodents are common because they are so well adapted to the hospital environment. Flies such as drain flies, humpbacked flies, vinegar or pomace flies, house flies and other filth flies are more commonly encountered in hospitals than in nearly any other type of pest management situation. In part these fly problems are so frequent because of the complex plumbing systems typically found in hospitals. This may include literally hundreds of sinks, floor drains, lavatories and so forth .The storage of snacks foods such as candy, nuts, cookies, potato chips and fruits contribute to chronic pest problems in patient rooms. Consequently, they are frequently infested with German Cockroaches or other pests. 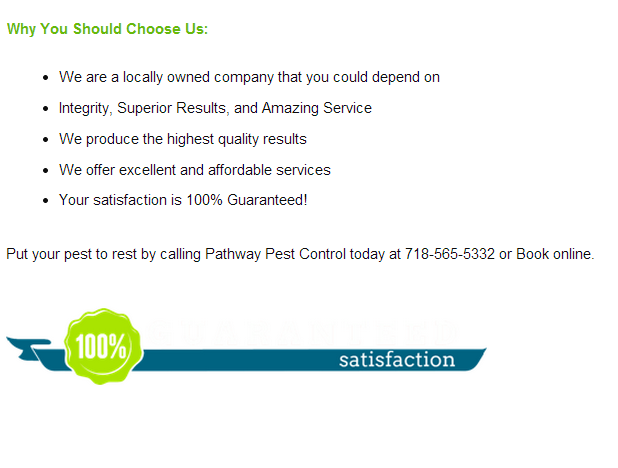 To learn more about pest control services for the health care industries call us at (718) 565-5332 or book online.